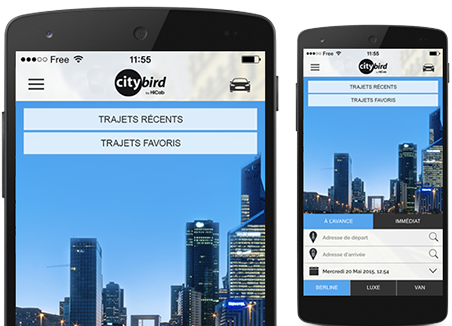 3 ranges of cars with drivers are added to Citybird’s motorcycle taxis, which now covers all your city appointments. Have you ever driven in 2 wheels in Paris? For an attractive price, discover the maxi scooter Suzuki Burgman 650 to arrive on time to your appointment. If you are a regular on the 2 wheels, you will appreciate the comfort of the Honda moto Goldwing 1800 for your daily travel, no worry about the traffic and weather conditions. If you are looking for comfort and luxury for your trips at any time of the day, choose the sedan and its affordable price. 3 ranges of cars with drivers are added to Citybird’s taxi motorcycle, which now covers all your urban trips. Your are looking for quiet and comfort to work by moving. Choose our luxury sedan, its Wi-Fi on board and its personalized welcome in train stations and airports. Whether you want to extend your business meeting with your employees or customers to the airport, or you are looking for spacious comfort, choose our vans (up to 7 passengers). Citybird is the No. 1 Motorcycle Taxi in Paris and in the île de France. Small companies, large Groups, Administrations, there are about 170 today. They have often chosen Citybird after a call of tenders to ensure availability, quality service to their employees, as well as services and negotiated advantages. Citybird, number 1 of the motorcycle taxi. What is the motorcycle taxi? Motorcycle taxi (or taxi motorcycle) is the generic term used to designate motorcycle and scooter drivers authorized to transport people for consideration. The term motorcycle taxi is thus misleading since motorcycle taxi drivers hold a professional card related to the practice of the profession of motorcycle driver and not a taxi license. These drivers obey to a jurisdiction similar to that of the VTC (tourism vehicle with Driver), they are independent motorcycle taxi drivers and Citybird partners in their people transport activity for valuable business. What are the advantages of a motorcycle taxi? By motorcycle taxi, you opt for saving time. Particularly suitable for transfers to the Paris airports (Orly, Roissy, Le bourget and Beauvais) or the train stations (Gare Montparnasse, Gare de Lyon, Gare du Nord …), the motorcycle taxi guarantees you to be on time for your plane or your train by avoiding you the traffic constraints. Time saving is the first virtue of transportation by motorcycle taxi. The motorcycle taxi (and scooter) is also used for its comfort, the experience of the motorcycle Goldwing 1800cc is herself a real reason to opt for this mean of transport. The scooter Burgman 650cc is a remarkable ally to avoid the dense urban traffic in Paris and in the île de France. The motorcycle taxi is also an optimum safety in the equipment proposed (air bag vest, helmet, reinforced gloves) and the driving style adopted by your driver, you are in good hands at Citybird! How do I book my motorcycle taxi? Log on to www.city-bird.com or download our app on iOS or Android. Do not wait any longer to reserve your first taxi motorbike with Citybird! Your position could not be found. corresponds to the case your flight arrives on time. Please fill in your train number and where you came from (eg Eurostar 1250 London). In addition, we advise you to add 5 to 10 minutes to the arrival time of your train then no waiting fees will be charged. For a booking in less than 25 minutes please select "Immediately"